Since its official creation in 2007, the Global Conscience Initiative has been both a voice and an instigator to improve human rights in Cameroon. During its existence, GCI has led projects on prisoners’ rights, human rights in the press, environmental protection, and youth outreach, working with local professionals, activists, and impassioned individuals to effect change in the Southwest Region and around the country. The origins of GCI date back to 2000, when two of its founders, Samba Churchill and Ntebo Ebenezer, worked together at the Human Rights Defense Group in Kumba under the direction of respected activist Albert Mukong. Upon Mukong’s death in 2004, the HRDG disbanded, yet Samba and Ntebo found themselves inextricably engaged in the struggle for human rights. Since both men believed that social change is rooted in youth empowerment, they started the Youths for Peace Initiative Cameroon (YPIC) with the help of local barristers and activists. YPIC aimed to promote and protect human rights through close work with youth. However, in 2007, both Samba and Ebenezer recognized that the demand for services didn’t just come from the youth; human rights abuses plagued all members of the population. With that realization, they decided to broaden the focus of the organization and change the name from Youths for Peace Initiative Cameroon to the Global Conscience Initiative. GCI’s initial services during 2007 included a continuation of its youth outreach and its open-door policy to reports of human rights abuses. Yet, troubled by the costly, inefficient, and ineffective justice system, GCI’s leaders started to envision a new model of conflict resolution, rooted in mediation and alternate dispute resolution (ADR), that would alleviate the beleaguered legal justice. This model, which came to be known as the Centres for Arbitration and Mediation (CAM’s), would be integrated into the work of the traditional councils in each village surrounding Kumba with the intent of minimizing the cases brought forth to the police station in Kumba. In 2008, GCI officially launched the CAM’s Project. To start, GCI conducted a series of surveys in 30 villages surrounding Kumba to gauge the needs of the communities concerning legal improvement and empowerment. Through these needs assessments, GCI identified a lack of understanding of corruption and human rights; furthermore, the surveyed villages did not demonstrate a sufficient understanding and practice of mediation and transparency. To resolve these issues, GCI held several workshops with council delegates from each of the targeted villages with the intent that the delegates would return to their communities and in turn, teach their fellow councilors. In late 2008 and early 2009, staff members in the CAM’s Project conducted follow-up surveys in the 30 villages that had sent delegates to the GCI workshops in Kumba. The assessments, however, revealed that the delegates had not properly disseminated the information they had learned at GCI, leaving the traditional councils and village communities relatively unchanged. GCI understood that it had to revise the CAM’s Project to deliver more in-depth workshops in the villages themselves in order to reach all members of the council and, hopefully, the rest of the community. During 2009, staff members conducted needs assessments in five selected villages in the Meme Division. Following these surveys, GCI created the CAM’s Grand Project, a comprehensive plan that would deliver a series of five workshops to the traditional council in each of the five villages, focusing on the topics of mediation, human rights, corruption, transparency, and mob justice. Also in 2009, under the direction of new Program Director Justine Lucas, GCI expanded its work into three smaller projects: a media watch group, an environmental campaign in light of the recent sharp decrease in Kumba’s waste disposal, and the formation of human rights clubs in five local secondary schools. With its new docket of programmes, GCI opened a new office in Buea, which took over the media watch initiative and the majority of the Prisoners’ Rights Project, while the Kumba office focused on CAM’s and the human rights clubs. GCI received a large number of international interns throughout the year who were very instrumental with the development of the organization’s programs. In 2010, GCI made progress in the CAM’s and Prisoners’ Rights Projects. However, due to the untimely death of then-CEO Samba Churchill and the subsequent resource issues and managerial deficiencies, GCI suspended all of its projects indefinitely in May 2010. For the rest of the year, GCI ccontinued to receive complaints and deliver legal advice and counseling, but it could not carry out outside work. Meanwhile, staff members reshaped and redeveloped the organization based on the new leadership and financial situation. 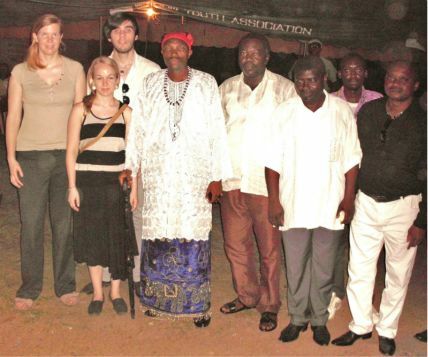 In early 2011, GCI reopened the CAM’s Project with the help of two new international interns. Given the downsized staff and the shortage of funds, GCI focused on only one village, Mofako Bekondo, where it carried out the workshop series prescribed in the Grand Project. During the summer, GCI conducted follow-up surveys in Mofako and received encouraging results about the Project’s effectiveness. The staff ultimately determined that in order to effect lasting change in the traditional council and the community, GCI needed to establish a long-term relationship with the village, working with various social and political groups outside of the council and holding regular workshops over the course of several years. In the fall of 2011, GCI was concerned with perfecting its CAM’s Project as it worked closely with the village leaders to successfully design and implement a model of social and legal change in the Meme Division’s villages. GCI has also conducted an advocacy campaign for the 2011 elections. In early 2012, three new international interns arrived to take new initiatives in order to promote the work of the organization globally, to continue the important work in the CAM’s Project, and to restart the Human Rights Hour radio show and most importnatly the Prisoners’ Rights Project. As the year progressed there was a gradual increase in the capacity of GCI and especially its largest project, CAM’s. From the beginning of 2013 GCI staff continued to focus on CAM’s where a period of large scale project redesign was initiated. New interns arrived that amplified this process, and the operations of GCI at large were expanded with an emphasis on human rights. In March the first edition of a new monthly publication was released, Global Conscience Monthly, that chronicled the organisation’s work and any human rights violations in the local area. GCI continues its important work.